Social Video Lab is pleased to showcase our very first foray into Indonesia. 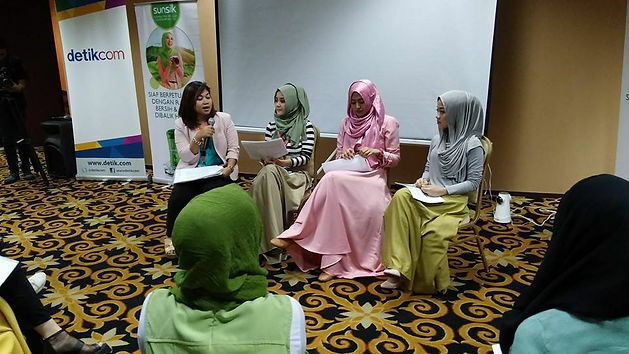 In collaboration with Mindshare, we organised and conducted a YouTube workshop as part of Sunsilk Indonesia’s Hijab Hunt 2015 competition. 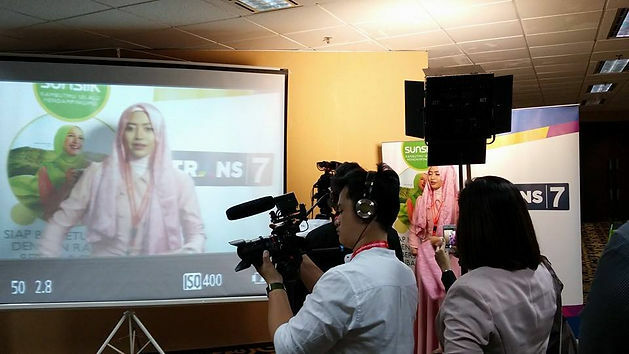 A widely broadcasted event on TV channel Trans7 and streamed on detik.com, the Hijab Hunt was an annual fashion event that reached out to the whole of Indonesia. Lasting four months, the competition saw hundreds of Indonesian Muslim girls vying to be the most engaging personality with the best hijab fashions. Auditions were held in 5 Indonesian cities, where girls auditioned to qualify as semi-finalists. A panel of judges were invited to whittle the large numbers of participants down to 50 semi-finalists. As part of the elimination process, these 50 semi-finalists had to produce their own hijab videos. The Indonesian public was then roped in to vote 15 girls into the finals. We were invited to conceptualise and conduct a workshop on YouTube video production for these semi-finalists in Jakarta. The top three YouTube vloggers in Indonesia were invited to speak at the workshop, presenting their personal style and video tips. These experienced vloggers also shared their take on what makes an outstanding video with the semi-finalists. Our video crew also led the event coverage shoot for the workshop as well, ensuring both the film crew and the workshop ran smoothly. This first-time venture into video content production for Indonesia has left us with many great memories and a burning desire to work with more awesome brands in Indonesia. Thank you, Mindshare and Sunsilk Indonesia for having us!